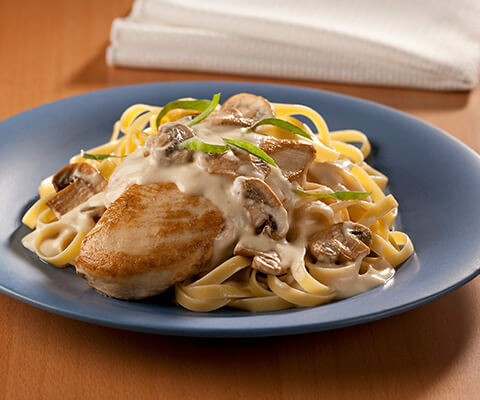 Serve this creamy delight over pasta or rice if desired. Heat oil in a large skillet over medium high heat. Brown chicken for 2 to 3 minutes on each side and remove from skillet. In the same skillet over medium high heat, add mushrooms and cook for 3 to 4 minutes, stirring occasionally. Stir in pepper and wine, reduce heat to medium low and simmer for 2 minutes. Stir in Pasta Sauce and return chicken to skillet. Cover and simmer for about 15 minutes, or until chicken is cooked through, stirring occasionally. Stir in basil and serve immediately. If desired, substitute 1/4 cup of chopped fresh basil with 4 tsp. of dried basil. If desired, substitute Marsala wine with cooking sherry. If desired, substitute Classico Creamy Alfredo Pasta Sauce with Classico Four Cheese Alfredo Pasta Sauce. I made it the way the recipe said, but substituted the wine with chicken stock and added onions to the mushrooms. Soooo fantastic!! The flavor was unreal! I also omitted the basil, which I didn't have any and used the Classico Sundried Tomato Alfredo. Will definitely be making this again! I made this for Christmas a few years ago and everyone loved it. It's become a tradition to have this for the holidays. Hint: Make double the sauce - it's that good. My family sops it up with whatever bread or biscuits I make.